When Apple releases "iOS 11" later this year, one of its features will allegedly be a new Music app that "better showcases video" —specifically, video hosted on Apple Music. The change is meant to direct people to the original programming Apple is developing, Bloomberg indicated on Thursday. 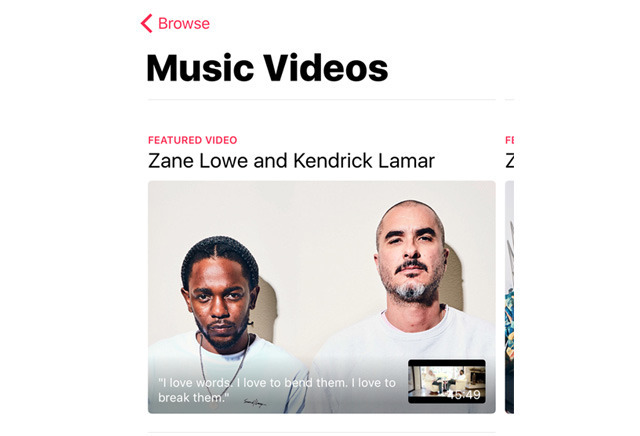 While video isn't particularly difficult to discover in iOS 10, much of it is hidden behind a "Music Videos" section under the Browse tab —despite it including high-profile interviews and concert footage. Apple could debut as many as 10 original shows and documentaries by the end of the year, Bloomberg said. While at least four of these are already known —"Carpool Karaoke," "Planet of the Apps," and documentaries about Clive Davis and Cash Money Records —sources claimed that another is a documentary about Bad Boy Records, the home of Puff Daddy and Notorious B.I.G., which became embroiled in a notorious fight with Death Row Records. Apple Music executive Jimmy Iovine is meanwhile said to be fomenting a possible sequel to R. Kelly's R&B opera "Trapped in the Closet," and talking broad, non-music concepts with "Star Wars: The Force Awakens" director J.J. Abrams and "Empire" producer Brian Grazer. Iovine told Bloomberg that "Apple Music is nowhere near complete in my head," while suggesting that any growth will be slow but deliberate. "iOS 11" will likely be shown off at June's Worldwide Developers Conference, then enter a beta phase before launching alongside new iPhones in the fall. Few other features have been rumored so far, among them deeper Siri integration into Messages and iCloud, group video calls in FaceTime, and the elimination of any 32-bit app support.